The Military Times database draws from over 7,500 records. 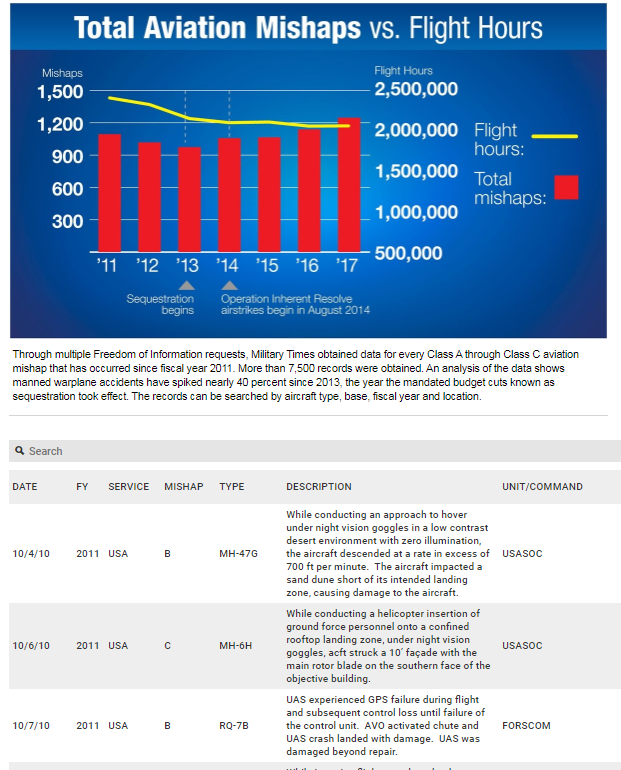 A six-month Military Times FOIA investigation shows an alarming trend – accident rates are soaring among the military’s manned warplanes. Specifically, the Times found “that accidents involving all of the military’s manned fighter, bomber, helicopter and cargo warplanes rose nearly 40 percent from fiscal years 2013 to 2017. It’s doubled for some aircraft, like the Navy and Marine Corps’ F/A-18 Hornets and Super Hornets.” At least 133 service members have died as a result of those accidents. The Times links the rising accident rates in part to 2013 budget cuts and non-stop deployments. The Military Times published its crash database here. The FOIA’s were sent to the Naval Safety Center, the Air Force Safety Center, and the Army Combat Readiness Center. In 2011 Pruitt, then the Oklahoma Attorney General, prompted by former U.S. Senator Tom Coburn, asked the state auditor Gary Jones to investigate Tar Creek. The state auditor delivered the report in 2014 that detailed an “alleged conspiracy against the state involving public officials” at the Oklahoma Department of Central Services. Then Pruitt, “in a move likely unprecedented in Oklahoma history, ordered Jones to not release the audit publicly.” Jones “vehemently disagreed” with Pruitt’s decision. Pruitt forbade the state auditor from releasing the report. But in 2014 he did share it with the lead attorney for the Lead-Impacted Communities Relocation Assistance Trust, which was buying homes in towns contaminated by Tar Creek. The attorney, Andy Lester, then determined from the audit – contrary to the findings of the state investigators – that there was no evidence to support the fraud allegations and that the audit “has no basis in fact and is not well-founded.” Lester shared the audit with LICRAT’s board. The Oklahoman’s Justin Wingerter has been doggedly following this story. An EPA FOIA response to Buzzfeed’s Jason Leopold’s FOIA request for records about death threats against Scott Pruitt contradicts Pruitt’s claims that he needs an extensive, round-the-clock security detail because of numerous death threats he has received. Pruitt and EPA spokespeople have used the claim of “unprecedented” death threats to justify a 19-person, 19-vehicle security detail that costs $2 million a year. The EPA, however, told Leopold that it had no records on the matter. And while it’s not uncommon for an agency to claim a no-records response when there are in fact responsive records, it begs the question why Pruitt’s detail needs to be three times larger than his predecessors. 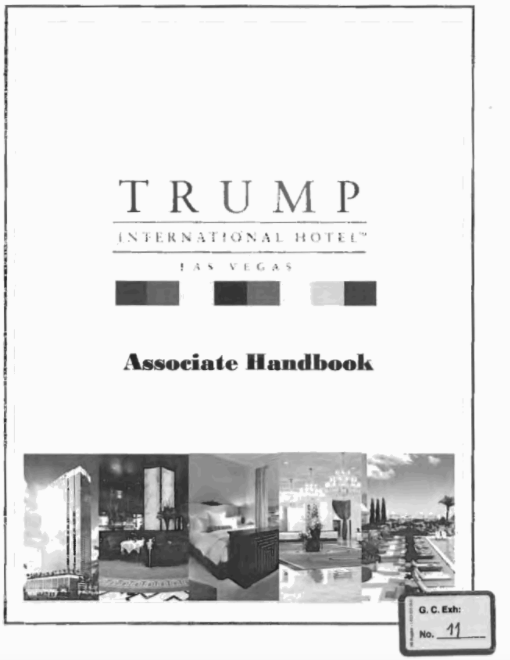 Property of the People recently won the release of the Trump International Hotel Las Vegas employee handbook thanks to a FOIA request to the National Labor Relations Board. The handbook discourages, for example, the hiring of family members for top positions, and bars relatives from working under the direct or indirect supervision of another relative. The manual also includes two provisions that employment attorneys say “could run afoul of federal law”: barring male employees from having visible tattoos with some exceptions and barring all female employees from visible tattoos, and banning male employees from braiding their hair – potentially raising “concerns about racial discrimination” towards black men with braids or dreads. Secret CIA interviews with defectors, former German POWs, and previously detained German scientists and technicians in the mid-1950s yielded invaluable insights into Soviet nuclear capabilities, according to recently declassified intelligence records posted by the National Security Archive. The latest posting from our Nuclear Vault highlights several reports of interviews with well-placed sources, some of whom were targeted by a joint British-American intelligence activity code-named Operation DRAGON, aimed at persuading key figures to defect to the West. Omnipresent in discussions of military use of cyber is how cyberspace fits in with the other warfighting “domains” of land, air, sea, and space. This question is vital to several issues facing future security and force planners including military command and control doctrine and the possibility of deterring aggression in one domain with the promise of punitive measures in another (cross-domain deterrence). Today’s Cyber Brief posting features a recent report published by the United States Army War College Strategic Studies Institute on the interplay between the land, space, and cyberspace domains, and includes selections from the significant volume of US Government publications the report references. This report, and the literature it draws on, provides a deep profile of cyber’s importance to the future “joint force”. The Archive’s Southern Cone project director, Carlos Osorio, joined an expert panel last week at the George Washington University’s Elliott School of International Affairs for a discussion on “Argentina Declassified: The Release of U.S. Government Records on the Last Military Dictatorship.” Osorio was joined by State Department historian Sara Berndt and Wilson Center Public Policy Fellow Benjamin Gedan; the event was introduced the Ambassador of Argentina to the United States, Fernando Oris de Roa. If you missed the discussion, the video of the event can be accessed here. TBT Pick – Who Killed Jaime Garzón? This week’s TBT pick comes from the Archive’s Colombia project and is a 2011 posting on the assassination of beloved Colombian journalist and political satirist Jaime Garzón. The posting published, for the first time, a-declassified State Department cable supporting longstanding allegations that Colombian military officials ordered the killing.